for a chance to win, leave a comment here telling me where you would like to hang it and "follow" this blog. you can also increase your odds of winning and gain extra entries if you follow jikits on facebook, follow jikits on twitter, and spread the word by tweeting about this giveaway (please tag your tweet with @jikits ). this giveaway is open to the world and will close on thursday, march 1st. i will draw a winner and announce it here on friday, march 2nd. awesome mobile! thanks for the chance to win - i would love to hang this in my family room. I love these! I'd hang it outside on a tree branch with the mountains in the background. Just found you on facebook! 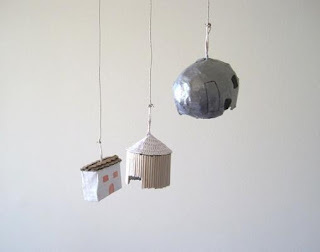 I'm crazy about these mobiles! We just bought a home and this would be perfect in any room. There's a great spot in the kitchen where it would be a real beauty! Thanks for your comment in our blog!this mobiles are amazing! Oh I love your mobiles and will spread the word via facebook and twitter. hi maxabella, this is my very first art giveaway and i'm thankful to be able to make something special to give away to someone special. it takes a lot of time to make these little homes. hey can i enter? id hang it in the kids room!! miss you lady! I've loved this mobile for ages!! I've got the perfect spot in our bedroom, which now that it's finally built, is in desperate need of some art :) Thanks for the opportunity Kim! these are adorable! thanks for visiting me at my place! oooh quickly!! discovered your blog just in time for this giveaway which i think is awesome! I love love love mobiles, made one myself but failed miserably, so this one would fill an empty spot waiting for a beautiful replacement.